Homeowners who are looking for a freestanding patio cover in Las Vegas – your search has come to an end. For over three decades, Ultra Patios has been increasing outdoor living spaces by installing new freestanding patio covers. Having additional square footage in the shade to keep cool under makes the unrelenting Las Vegas sun not only tolerable but also enjoyable. Take advantage of a versatile solution designed to cool your leisure areas. Protect your friends and family members from the damaging effects of the summer sun. Freestanding patio covers are ideal for shading your barbecue grill, seating area and patio sets, or lounge areas next to the pool. Put the experts at Ultra Patios to work for you. As a family-owned and operated business in Las Vegas, we understand the importance of spending quality time with those you love, and we work diligently to help you make the most of that time. What Is A Freestanding Patio Cover? Freestanding patio covers provide relief from the elements through the use of a standalone structure that does not need to be attached to a building. What separates freestanding patio covers from standard patio covers is the fact that they are not attached to your home, which adds additional usable outdoor square footage. Our patio covers are a sensible and affordable solution for increasing the level of comfort of your outdoor area. As a stand alone permanently installed structure, it will add both visual appeal and value to your home or business. In addition to providing a comfortable, relaxing backyard oasis in which to entertain, our freestanding patio covers are virtually maintenance-free. All of our products come with a limited lifetime guarantee and are installed by trusted professionals. The textured wood grain finish perfectly mimics the look and feel of real wood while simultaneously providing the strength and resistance of embossed aluminum. Our Alumawood and Elitewood products do not chalk or fade, allowing you to spend less time painting and replacing old rotted wood and more time enjoying your newly revamped outside space. Our freestanding patio covers are available in a variety of styling options and colors to match any preference. 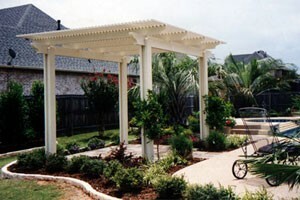 We provide affordable turn-key patio cover projects complete with permits. We guarantee all of our work and we’re licensed, bonded and insured. Maximize the usability and comfort level of your backyard, front yard or any outdoor living space. Call Ultra Patios today for a free no obligation in home estimate and to discuss possible design options.